This Is The Big One Folks! Another year and another Roctober! This event goes by many names…Sweetest Day Ride, Chocolate Ride, Chocolate Clunker, or what I always knew it as…Chocolate Clunker Cruiser Classic. Say that 5 times really fast. 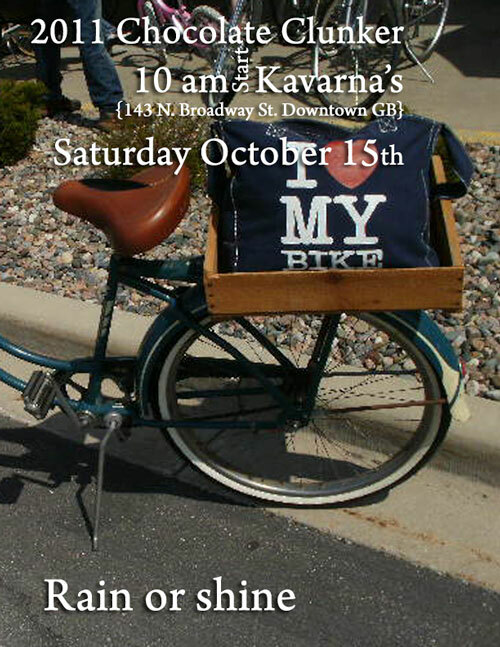 This ride is, by far, the largest clunker/cruiser critical mass ride we participate in here in Green Bay. It’s always held on Sweetest Day, which is appropriate, since we stop at three different confectioners between Green Bay and De Pere. As with all of our cruiser rides, we set a slow pace and encourage y’all to dust off those old single speeds and bring the whole family. There’s a skid contest and in the past, a tire tube blow-up contest. There have been prizes for best bike story, oldest bike, most unique bike…etc. So come on out! It’s a blast and a great chance to meet fellow riders and enthusiasts.